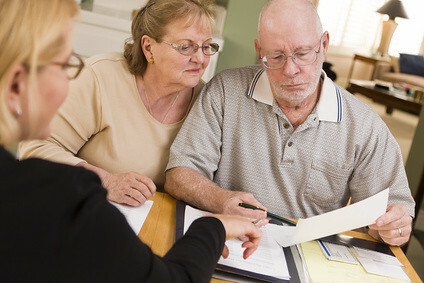 The pictures show either a couple sitting across the table at the advisor’s office or the advisor coming to their home. The common phrase for working with an advisor is “sit down with an advisor.” Obviously it’s not saying you shouldn’t be standing up; it implies you should work with someone local. The popular lead-generation sites for fee-only advisors — NAPFA, FPA, Garrett Planning Network — all lead the search by your zip code, because most people look for one local to them, as people do when they look for a doctor, or for that matter, a car mechanic or a plumber. Besides the mom-and-pop fee-only advisors found on NAPFA, FPA, or Garrett Planning Network, who else are local? You have your investment person sitting in a bank or credit union branch. You have people working at Fidelity or Charles Schwab branches. You have people working for Ameriprise, Edward Jones, Merrill Lynch, Morgan Stanley, UBS, Wells Fargo, and a number of other companies. People representing insurance companies such as Northwestern Mutual and New York Life offer investments too. Why are they local? Because people believe their advisor must be local. Is it really necessary to have your advisor local to you? The advisors I listed in my article The Average Investor Should Use An Investment Advisor: How to Find One are located in different parts of the country. I didn’t even mention where exactly they are. What makes an advisor local to you better than an advisor far away? Nothing. Unlike a doctor, an advisor doesn’t have to touch you in order to figure out what’s best for you. Good advice is good advice whether it comes near or far. I can understand people want a local bank branch to make deposits and withdrawals, but trades are executed online anyway. At work, I routinely work with colleagues two time zones away. We exchange emails and documents. We go on conference bridge lines, often multiple times a day. Sometimes we talk to people on another continent via video conference. We get quality work done. When I had the consultation with the Vanguard advisor, I didn’t care where she was. I spoke to her by phone and via video conference. She answered my questions just as well as she could if I were sitting in her office. We all tend to think our own questions, problems, and challenges are unique when in fact they are actually very common. Even though the Vanguard advisor didn’t have 20 years of experience in finance and investing, her answers were on target. My questions didn’t require 20 years of experience to answer. As a salaried advisor getting clients handed to her day in and day out, she must have a lot of practice, probably way more than the independent CFPs who spend more time in prospecting. If you limit yourself to someone local, you will miss the good advisors in terms of both quality and cost. Local people have better skills and more practice in sales and marketing, not necessarily in advice. If you just look around, or you answer calls from local people, or you take referrals from friends or family, you more likely will find a salesperson, if only just by the law of numbers. Look beyond your local area for your financial advisor. Except for the need to be careful with state and local income tax and state estate and inheritance tax implications. You need to be sure that your advisor is in tune with these specific geographical issues if they will affect your financial planning. Great insight, Harry. Thank you. As a financial advisor (and NAPFA member) I would agree and disagree with you. It is true that perhaps an advisor outside of one’s local area might be the best advisor for them. On the other hand to many clients there is an advantage to being able to sit down face to face with their advisor. I work with clients both locally and in several other states and often do phone meetings with clients. With tools like Go To Meeting and other similar tools the delivery of advice has certainly changed. You seem to have a bias towards your Vanguard advisor and seem to think that all independent advisors do is prospect for new clients. I can’t speak for all independent advisors but I can tell you that I spend far more time doing planning and investing work for my clients as well as monitoring their holdings and financial situation. And this doesn’t include the work I do for the several 401(k) sponsors for whom I serve as an advisor. I’m not knocking Vanguard’s advisory service or any of the other low-cost services that you seem to be fond of but I think you fail to discuss the value of an experienced, independent fee-only advisor. Again different strokes for different folks so to speak. Perhaps you might consider a piece on how to choose an advisor, what to look for, when the low cost, bare bones services are appropriate and when someone who is more full-service makes sense. I’d be glad to offer my thoughts if you are interested. I’ve written extensively about financial advisors on my blog feel free to use anything there if it helps. I was pointing out that if people limited to their local area they will miss the opportunity to work with fine advisors such as yourself. 🙂 I don’t think the Vanguard advisor I spoke to was the greatest. Few would pick her if they saw her resume. But she was adequate. Money issues that seem complex to the client are often pretty standard to an advisor. In your experience how much time does an average advisor spend on sales and marketing? That’s a great point. Thank you. Harry good question I really don’t know how much time on average advisors spend on sales and marketing. I have been in a study group of 8 NAPFA advisors for several years and I’d say that most of us spend a small percentage of our time there. I’ve been fortunate over the past year or so to have gained some marketing traction from my blog. I will say that as a group many of the advisors I know do try to network with other professionals such as CPAs and attorneys to try to build referral relationships. This also allows us to find good professionals to refer clients to when these services are needed. All that said different people at different stages of life have differing needs. My client base tends to be a bit older and more established so the types of tailored services and advice I provide are appropriate. Those same services and fees might not be appropriate for clients just starting out for example. Great article– I am a US adviser who lives abroad– 25% of my clients are in the US, scattered around the North East and western US. I find that being “away”helps me be more objective. you don’t get caught up in the group-think/herd mentality that is so pervasive in much of the financial advice business today. Occasionally I run up with certain state specific tax issues, but it is a rarity.